Flying 2,500 miles across the country — from Florida to California — to participate in a Sunday morning mountain hike might seem a little extreme to the average person. I had doubts myself, until I arrived. It turned out to be one of the most inspiring things I’ve ever done. Being part of the 4th Annual 5K Walk/Hike for Mesothelioma Research at the Paramount Ranch in Agoura Hills was an experience I won’t forget. The event is an important fundraiser for the Pacific Meso Center, a specialty treatment facility that strives to uncover more effective treatments for this insidious cancer and one day find a cure. This year’s event was the most successful to date, raising more than $100,000 for mesothelioma research. I’m proud my company supports the effort. My wife and I both made the trip. We were a little anxious going in and weren’t really sure what to expect. What we found were more than 300 culturally diverse people of all shapes and sizes. Ages ranged from 8 to 80. We were all committed to a single, well-defined cause. We were raising awareness and money to fight a cancer that most people have never heard of. It left me re-energized, proud and excited to be part of this group. Honestly, it was more than I ever expected. My wife and I registered as Team Asbestos.com. The hike drew lots of teams, ranging from two members to a dozen or more. Many teams included extended family members who hiked to remember a loved one they lost to mesothelioma. Others supported people with mesothelioma currently undergoing treatment. I met a few newly diagnosed patients on the hike, and they were not stopping. It was hot and dry out there, drought conditions, but everyone participated and I never heard anyone complain. Each team wore different colored T-shirts, but there was tremendous camaraderie among everyone regardless of the team they represented. It was like everyone knew each other, bonded by something meaningful. Someone fell at one point, and his team members quickly came to his aid. He kept hiking. The whole event was uplifting for me. I met Dr. Robert Cameron for the first time. He’s one of the top thoracic surgeons in the country, the driving force behind the Pacific Meso Center and a pioneer in mesothelioma therapy. Multiple people there told me they owe their life to Cameron for what he has done. People really believe in him. If you meet him, you’ll understand why. You can see how passionate he is about what he does. He also makes helping veterans with mesothelioma a priority. Throughout the hike, we passed signs displaying facts about mesothelioma and asbestos. I saw one team stop to gather around a marker commemorating a loved one who had passed. Together, they listened to his favorite song through a smartphone. There were tears. It was emotional, but at the same time inspiring. Afterward, there was lunch for everyone. Lunch was followed by a series of speakers, including Terry Latham, a five-year mesothelioma survivor who is so grateful. Dennis Zine, the honorary mayor of nearby Woodland Hills, served as master of ceremonies. He was filled with energy. I met the family of Chuck Jarvis Jr., whose father fought mesothelioma so courageously and became the driving force behind the Great Escape Motorcycle Ride, another Pacific Meso Center fundraiser. The event also included a raffle drawing with some great prizes. I didn’t win anything, but I didn’t care. I felt proud just knowing we helped raise money for a good cause. The band Red Mutts played, and everyone had a great time. When it was over, though, it seemed like no one wanted to leave. It felt like one big family. Eventually we left, but I’ll be back next year. 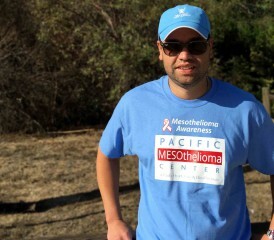 Jose Ortiz is the Medical Outreach Liaison for The Mesothelioma Center and a contributing author for Asbestos.com. He writes about outreach initiatives, including sponsored events and collaborations with mesothelioma specialists and cancer centers.